The mod_aggregate system was added in the 2014.7.0 release of Salt and allows for runtime modification of the executing state data. 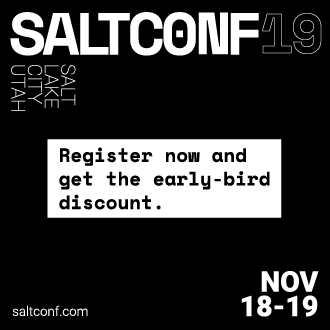 Simply put, it allows for the data used by Salt's state system to be changed on the fly at runtime, kind of like a configuration management JIT compiler or a runtime import system. All in all, it makes Salt much more dynamic. The best example is the pkg state. One of the major requests in Salt has long been adding the ability to install all packages defined at the same time. The mod_aggregate system makes this a reality. While executing Salt's state system, when a pkg state is reached the mod_aggregate function in the state module is called. For pkg this function scans all of the other states that are slated to run, and picks up the references to name and pkgs, then adds them to pkgs in the first state. The result is a single call to yum, apt-get, pacman, etc as part of the first package install. Since this option changes the basic behavior of the state runtime, after it is enabled states should be executed using test=True to ensure that the desired behavior is preserved. The first way to enable aggregation is with a configuration option in either the master or minion configuration files. Salt will invoke mod_aggregate the first time it encounters a state module that has aggregate support. If this option is set in the master config it will apply to all state runs on all minions, if set in the minion config it will only apply to said minion. The second way to enable aggregation is with the state-level aggregate keyword. In this configuration, Salt will invoke the mod_aggregate function the first time it encounters this keyword. Any additional occurrences of the keyword will be ignored as the aggregation has already taken place. The following example will trigger mod_aggregate when the lamp_stack state is processed resulting in a single call to the underlying package manager. Adding a mod_aggregate routine to an existing state module only requires adding an additional function to the state module called mod_aggregate. The mod_aggregate function just needs to accept three parameters and return the low data to use. Since mod_aggregate is working on the state runtime level it does need to manipulate low data . The three parameters are low , chunks , and running . The low option is the low data for the state execution which is about to be called. The chunks is the list of all of the low data dictionaries which are being executed by the runtime and the running dictionary is the return data from all of the state executions which have already be executed. # What functions should we aggregate? # Pull out the pkg names!